Maslenitsa, also known as “butter week” or “pancake week”, is an ancient Russian folk festival. 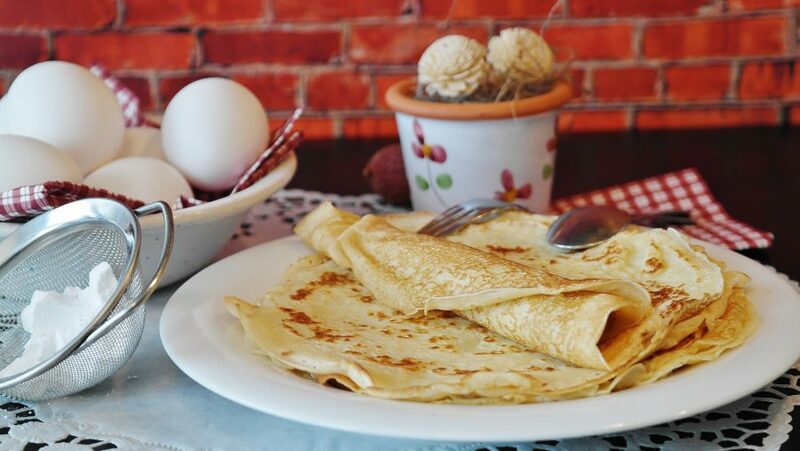 Maslenitsa has its origins in both pagan and Christian traditions and it is considered a farewell to the winter and meeting of the beautiful spring. It is celebrated with blini (Russian pancakes), visiting of your loved ones and friends and burning of a Maslenitsa scarecrow. The time of Maslenitsa is different each year, as it depends on the time of the Orthodox Easter. Orthodox Easter is quite late this year and falls on April 28th. So “Butter Week” will last from 4th to 10th of March. The last day of Maslenitsa, March 10th, is Forgiveness Sunday. On Monday, March 11th, the Great Lent will begin, which will end on Saturday, April 27. How did this tradition evolve – one of my favorite questions in history. How did people come to celebrate or follow a certain tradition? Most of the time it makes sense!Pancake week is a folk festival and very ancient. Even before the adoption of Christianity, people, noticing how the day is extended, tried to “attract” spring with fun festivities. Blini (Russian pancakes) – traditional dish from the ancient times of Maslenitsa symbolize the sun, which gives life to all things. From the Christian perspective, Maslenitsa is the last week before the Great Lent. So during the week of Maslenitsa, strict Orthodox Christians already do not eat meat. And it is the last week during which milk, cheese and other dairy products are permitted, leading to its name of “Butter week”. Traditionally, the Butter Week begins on Monday and ends on Forgiveness Sunday. Every day of this festival is unique and carries its own meaning. Some countries with a significant number of Russian immigrants consider Maslenitsa an occasion to celebrate Russian culture. truly, it is one of the most fun (and tastiest) Russian holidays. But who really needs an excuse to enjoy Russian Blini all week? It is one of my favorite times to cook Russian pancakes and share my culture with people around me. Monday (March 4th, 2019) – the Welcoming or Meeting: people make street markets and pavilions and Maslenitsa scarecrows (giant dolls made out of straw and old clothes). People start baking pancakes. Tuesday (March 5th, 2019) – the Playing or Flirt – people play games and activities outside, single girls do fortune telling, matchmaking is going on. Wednesday (March 6th, 2019) is the Sweet-Tooth day. On that day sons-in-law go to enjoy pancakes by their mothers-in-law. Thursday (March 7th, 2019) is the day when people should stop doing any household chores and just have fun for the rest of the week. This day is usually called “Razgulay” or Abundance Thursday. People enjoy festive parties, visit bazaars, play games outdoors and do sledding. In the old times that was also a day for fist-fighting tournaments. Friday (March 8th, 2019) is “Mother-in-law Visiting” – the day when sons-in-law cook their mothers-in-law blini and make dinner for them. On Saturday (March 9th, 2019), “Zolovkin’s party” young wives invite their sisters-in-law to eat pancakes and give them presents. Finally, March 10th, 2019 is the Forgiveness Sunday. On this day you ask everyone for forgiveness for any harm you might have done intentionally or unintentionally. It is also the day when the Maslenitsa scarecrow is burnt. Its ashes used to be scattered in the fields to end the winter and bring the good harvest in the spring. The next day (February 19th, 2018) the Great Lent starts and some Orthodox Christians give up meat for 40 days until Easter. It is the spiritual preparation that comes before the most important Feast of the Christian year, Holy Pascha (which means “Passover” or “Easter”). Would you like to try making blini yourself? Follow this recipe and you will find that it is not that difficult to try and make it. You will fall in love with versatility of the filling choices. You can have it as a breakfast with some cottage cheese and milk, for lunch with meet and vegetables and for dinner with caviar. I promise, you won’t get tired of them! During this week, you can also try making syrniki (Russian cottage cheese cakes) and other Russian dishes that contain butter, eggs and milk. Does this holiday seem a little crazy? You are more familiar with it than you think! Have you heard of the Patras Carnival or Mardi Gras? Just like Maslenitsa, Patras Carnival has a connection with ancient pagan rituals. And the ritual burning of the carnival king at the St. Nikolaos Street is a traditional ending to the Patras Carnival. Many countries, including the United States, celebrate Mardi Gras. The holiday begins as early as Three Kings Day and ends on the day before Ash Wednesday. Mardi Gras is French for “Fat Tuesday”, also reflecting the practice of the last night of eating rich, fatty foods before Lent. Everyone has their own blini recipe and different alterations will make your blini a little different. This is the one I find the easiest and the crepes always turn out perfect! Anything from Nutella, Jam, Fruit, Sour Cream, or just Honey! Or, you can add chicken, sausage, vegetables inside if you’d like. Just use a little less sugar in the batter for savory blinis. Mix eggs, sugar, milk, kefir salt and baking soda. Then gradually add flour and mix with a mixer. The consistency of the batter should be a little thicker than cream. Pour a little bit of sunflower oil to the mix. Use a scoop and pour the batter in the middle of the pan. Tilt the pan while pouring, forming a circle with the batter. Flip the pancake over with a spatula, after the surface looks porous and sides are golden – about 30 seconds. Fry for half of the time on the other side. Repeat. With each pancake your blini will look better and better. There is even a Russian saying – “The first blin is always lumpy” you’ll get them right after two or three. Spread a little butter on each blin as you stack them on the plate to keep from sticking. You can put it in the warm oven before serving. Choose any filling and let your guests assemble them and make fresh! Have a great Maslenitsa and spend some time with your Russian friends during that week! They will appreciate it and most likely will feed you blini! Hi, I'm Marina, passionate traveler and blogger, based in the United States and travelling the world. Thanks for following me on my life and travel adventures!